Published on July 18, 2013 in Announcements. If you’ve been keeping an eye on our RSS feed or following hashtags on Twitter, you’ve no doubt seen a couple of badly formatted posts about the latest release of Byzantium Linux being made available. Now that we’ve had some time to catch our breath, consider this our official announcement of the new release. We’ve decided to call this one Sleep Deprivation because we incurred a significant amount of it while working on this release. Life and things being what they are, it took us a little while to hit our stride because we’re operating at reduced capacity right now due to the unique summer environmental of the Washington, DC metroplex. You’ve also probably seen a couple of new tabs on the website, among them a changelog depicting major alterations or upgrades to the distribution. We haven’t forgotten ByzPi, the RaspberryPi port of Byzantium Linux either. The packages and configs for ByzPi have been updated to match those in the x86 version, ensuring complete compatibility. As always, this release is available from our download page. At this time, we’d like to request assistance from experienced Debian packagers to help us maintain ByzPi. Debian packaging is very new to us and we’re probably not doing a couple of things correctly. We would like to help the Debian community by our work, but we’d like to do it in such a way that we’re compliant with Debian’s policies for packaging (which will also no doubt make our package repository easier to maintain in the future). ByzPi changes as fast as Byzantium Linux for x86 does, which is to say, major releases only, but it’s still a very important part of the project. After much trial and a lot of error we decided to set up our own BitTorrent tracker to make it easier to distribute Byzantium Linux. The Pirate Bay, while very stable, helpful, and with a great community draws a lot of fire (in the form of net.censorship) and we’d like our work to get into the hands of as many people as possible. The other trackers were problematic in one way or another, and in the interest of getting things done we decided to take matters into our own hands. The tracker software we installed is called WP-Trader, and it implements a relatively simple yet powerful BitTorrent tracker as a function of our CMS. It also automatically posts new releases to our news feed whenever a new torrent is added. For additional redundancy we’ve also activated a couple of auxilliary trackers on some of our mirror sites using BitStorm, an ultra lightweight BitTorrent tracker implemented as a single PHP script. In addition to the BitTorrent DHT, we are fairly confident that we have a robust distribution system. We know, the formatting on our torrent descriptions is wonkky. Unfortunately, WP-Trader doesn’t seem to have a way of editing them at this time. As with any torrent, if you torrent Byzantium Linux please help the swarm and seed for a while so other people can download it more rapidly. As always, if you have any suggestions or want to report any bugs, please visit our bug trackers on Github (Byzantium Linux, ByzPi). You are also cordially invited to join our e-mail discussion list or join us in #byzantium on Freenode IRC. Published on June 30, 2013 in Announcements. As of this afternoon, we’ve completed the integration of amateur radio support into Byzantium Linux. We’ve added the necessary executables and libraries to the base build, so licensed ham operators with the correct equipment can begin experimenting with packet radio and mesh networking. We realize that support for this is a little thin right now, and after conferring with colleagues in the community we feel that the best course of action is to provide tools to facilitate further experimentation and development by both the ham radio and hacker communities. This constitutes the third milestone of our ISC development grant. Also, at long last, we’ve found a distributed chat application for Byzantium Linux. It’s called Groundstation, and it uses a gossip-like broadcast protocol which aims for the eventual synchronization of datastores over high latency links. Data is stored in Git repositories on the back end and a daemon called Airship provides a web front-end to the service. It works a lot like Twitter or Facebook‘s comment threads, and the nice thing about it is that whatever you post on one node will show up on other nodes within a few seconds, so users don’t have to be on the same node to hold conversations. We have a few threads set up by default which should help organize people’s messages. These are some pretty major changes, so we’re calling this release v0.4b – yes, we’re finally in beta! We’ve come a long way since the initial development cycle of the grant, and we’ve added some pretty major functionality to Byzantium Linux, so we think it’s worth a major version release. We decided to name this release “No sleep ’till Brooklyn!”, after the song by the Beastie Boys as well as our marathon road trip to New York City late last year. When considering how little sleep we got while working on this milestone it sort of makes sense. As before, if you are a Mac user, we recommend downloading this hybrid ISO image. Write it to a USB key with the ‘dd’ command and reboot while holding down the Option key. Select the ‘Windows’ device to boot Byzantium Linux. That doesn’t mean that you can’t use a hybrid ISO on a PC, some of us do and we’re quite pleased with it. gpg: Good signature from "Project Byzantium (Byzantium Development Team) <byzantium@hacdc.org>"
Published on June 22, 2013 in Announcements. The intended goal of our third development milestone was to integrate amateur radio functionality into Byzantium Linux. A persistent technical limitation of our network architecture is inherent in consumer 802.11 wireless chipsets – their transmission range is limited due to the design of their associated antennae, relatively short battery life, and limited radiated power (200mW). In practice, this means that wireless mesh networks may become segmented if one or more nodes are farther apart than the maximum theoretical range of 802.11 wireless. Signal attenuation results in the inability of radios to detect one another’s traffic. This limits the effectiveness of the network and hampers the ability of nodes to route traffic and synchronize. The higher transmission power allowed under amateur radio rules, superior transceiver quality, lower frequencies available, and greater antenna flexibility would help ameliorate these problems by providing increased range for independent nodes in the mesh. Fewer nodes would then be required to prevent mesh segmentation, and usable broadcast sites would be less scarce. Re-purposing existing amateur hand-held transceivers (HT’s) would be especially helpful, as most amateur radio operators already have several of these. After doing some research we discovered that amateur radio could be used for data transmission. Licensed amateur radio operators can use linear amplifiers, specialized antennae and other techniques to boost the effective strength of broadcasts on the 2.4GHz band, persuant to Part 97 rules. There are also transmission modes which can be used to transmit text and binary data over a number of amateur radio bands (such as 70cm and 2m). Our stated use case of temporarily repurposing portable devices as mesh nodes implied that investigating the use of hand-held amateur radio transceivers (HT’s) might be fruitful. We concentrated on HT’s capable of accessing parts of the amateur spectrum earmarked for data communications to see if we could send and receive mesh traffic and break the distance barrier. Digital radio transmission is typically accomplished by connecting an audio output device (such as a computer’s sound card) to a radio’s microphone jack. The audio output device supplies tones (for example, a 1kHz signal switched on and off in morse code or a similar carrier with phase modulation). In the case of single-sideband (SSB) radios this audio is frequency-shifted directly to radio frequency and transmitted without further modulation. For frequency modulation (FM) radios, a carrier is modulated by the audio input, but the original data can still be recovered by another FM radio. Thus, connecting a sound card to a radio with simple audio cables allows the computer to transmit data using arbitrary modulation schemes and protocols. Packet radio, the transmission of packetized binary data over the airwaves, was invented in the mid-1960’s but was first attempted by amateur operators in the late 1970’s in Canada. The techniques to accomplish this soon spread to the United States and then to other countries. The first amateur TNC (terminal node controller – a device analogous to a dialup modem for radio) was invented in 1980 and perfected by 1985 with the commercial manufacture of a device named the TNC-2. Many different modes, or methods of encoding data as sound were developed over the years; each mode works well under certain conditions and worse under others, supports a range of speeds (measured in bits per second), and are most usable in certain bands but not in others. Most data modulation schemes and protocols can be divided into slow, specialized protocols for sending text messages, and packet radio protocols, which existing support for networking. Morse code, PSK31, OLIVIA MFSK, and similar belong to the former category. Their functionality is equivalent to instant messaging, Internet Relay Chat, and serial console. Some of these protocols also offer great resilience to interference. In contrast, packet radio protocols (such as AX.25) tend to be faster and offer software with full networking support. Our research focused on the AX.25 protocol, which seems the most ready for practical application in our network architecture. AX.25 is a network protocol which roughly maps to the first three layers of the OSI network model (Physical, Data Link, and Network) and enables the transfer packets of information between nodes. AX.25 is capable of operating in virtual circuit mode (supporting IPv4); in other words, it functions akin to Ethernet or 802.11. We experimented with a software implementation of the protocol which is available as part of the Linux kernel since 1995. We tried an open source application called Soundmodem which uses the sound card of a computer to modulate and demodulate packets so that the Linux kernel can process them. Due to the fact that Soundmodem is an emulation of a TNC certain limitations are unavoidably imposed. First, for optimal functionality a fairly recent (newer than 2003) computer must be used due to how computationally intensive the encoding and decoding processes are. Second, Soundmodem is highly sensitive to the volume levels of the sound card; if the volume or microphone sensitivity are too low the radio may not trigger when a packet is sent, or packets may not be detected correctly. Conversely, if the sound levels are too high distortion and clipping may corrupt packets and interfere with operation. Third, many audio cables are unshielded, and radio frequency interference from the internals of the computer itself may cause packet corruption. Signal transients will definitely occur. Fourth, noise from the computer’s power supply or hamonic noise from many of the computer’s components can make their way into the audio output before it even leaves the machine. 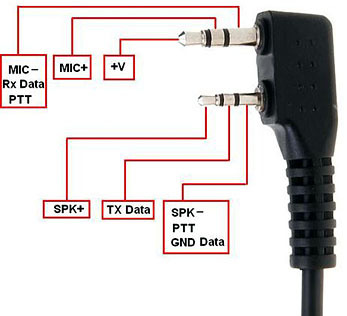 Additionally, not all radios have voice activation circuits (VOX) which switch fast enough for more than casual use of packet radio, so Soundmodem includes a number of drivers for activating external PTT circuits. This means that additional interface devices must be built, tested, and debugged ahead of time. This is not unusual for the amateur radio community as a whole, but for some prospective users it poses a nontrivial problem. Simultaneously, we engineered an additional software stack for Byzantium Linux which includes the necessary utilities and systemware for interfacing with amateur radios and configuring the resulting network interfaces. The software packages (ax25-tools, ax25-apps, and libax25 (http://www.linux-ax25.org/wiki/Main_Page)) have existed since the early days of the Linux kernel and many distributions of Linux include the necessary device drivers as loadable modules by default. We reconfigured several of the services running atop Byzantium Linux to avoid sending traffic over AX.25 or cellular interfaces to more efficiently use available bandwidth. A little experimentation revealed how to properly configure and test Soundmodem and the AX.25 network interfaces. We discovered that AX.25 interfaces are similar to Ethernet and 802.11 interfaces in most but not all respects. Protocol analyzers like tcpdump are not capable of interacting with AX.25 network interfaces, but the ax25-apps package includes its own (called listen or axlisten, which is paired with a packet generator called call or axcall). IPv4 works normally over AX.25, but implementations in recent Linux kernels (v3.8.7 and v3.9.4) are still not IPv6 enabled. Additionally, we were approached early in the R&D effort by another member of the open source community who has developed a software package called Groundstation, which is designed for synchronizing datastores over high latency and unreliable network connections – perfect for amateur radio. It also presents a responsive web front-end which permits users to read and post messages. We are working closely with Richo, Groundstation’s chief developer, to integrate it into Byzantium Linux and develop it into an application which will fulfill several of our design goals. We first attempted using the standard FSK (Frequency Shift Keying) mode which would have afforded us maximum bandwidth for the medium (9600 bps). We were unsuccessful in almost all of our attempts. We subsequently tried transmitting at successively lower speeds (4800 and 1200 bps) using FSK modes and were also unsuccessful. We then attempted and succeeded at bench testing using the PSK31 and Olivia transmission modes for sending and receiving plain text messages. We were even able to acoustically decode text sent using Olivia with a third laptop’s integral microphone across the room. When we disconnected the radios and connected two laptops together by cross-wiring their microphone and headphone jacks we had some success sending and receiving packets. In the end, we were forced to continue without working PTT circuits and used the VOX feature of our radios instead. This imposed a significant increase in latency and reduction in throughput. However, the technique was successful at initiating connections with other nodes and exchanging packets. During testing we were able to maintain TCP connections and transfer data in both directions, albeit slowly. There seems to be evidence that others in the amateur radio community have managed to achieve better results with similar hardware, so we believe that with additional work the techniques could be refined and tuned to improve throughput and reliability. In a later attempt, we used the built-in TNC of the Kenwood TH-D72 as the reference implementation against which to tune Soundmodem and were able to achieve a stable 1200 bps AX.25 link. This was sufficient to allow us to profile the network performance and characteristics so that we could establish a baseline for later testing over emulated network links. This strongly suggests that hardware TNCs seem to perform significantly better than Soundmodem, and we have ordered some common models to test with, however they have not arrived in time for use on this milestone. The most common problem we encountered was unidirectional connections. We were able to successfully transmit network traffic but were unable to receive it until near the end of the development effort. An AX.25-specific protocol analyzer (listen) showed that network packets were traversing the AX.25 network interfaces. A significant amount of ARP traffic was detected (approximately 25% of the traffic volume), as were a number of UDP broadcasts identified as originating from other applications running on our test machines (Avahi and Skype service announcements). The contents of these UDP packets were decoded correctly. ICMP traffic (generated by ping and traceroute) was problematic and incurred latencies measured in the tens of thousands of milliseconds. We were unsuccessful at establishing interactive TCP connections over AX.25 during most of the development effort. Test services were set up using NCat (in UDP server mode) and Python’s built-in HTTP server (TCP); the former was accessible only over a direct connection, the latter not at all. We are certain that packets were being broadcast because we used a third HT as a scanner and could hear the packets on the air. It is our recommendation that we leave amateur radio hardware support to the ham community but provide them with software and systems to enable effective support of non-licensed people in the mesh. We know that this technology is viable because the amateur radio community has been deploying it in a much more limited fashion for several decades with spurts of activity similar to what we would expect in a disaster situation. Some of the experiments we performed which followed in their footsteps were successful. Project Byzantium, however, lacks the skills and experience to bring this aspect of the project to fruition in the time allotted by the grant. To that end, we are making contacts in the amateur radio community who are working on similar projects and proposing interoperability and collaboration. Doing so will, unfortunately, have to wait until after the grant development cycle is done. Published on March 21, 2013 in Announcements. In late 2012, Project Byzantium applied for a technology grant from the Information Security Coalition. We were informed earlier this week after the selection process was over that Project Byzantium has been given a $10,000us grant to continue research and development for the next six calendar months! We will be putting the money toward additional equipment to test and debug Byzantium Linux on as well as hardware to experiment with integrating Byzantium Linux into various and sundry amateur radio-related data communications networks. Our final milestone will be v0.4 of Byzantium Linux somewhen in August of 2013. We know, v0.3 isn’t out yet. Workaday life ambushed us, and we have one final bug left to fix before we can release it. We’re hacking as fast as we can, we promise! You are currently browsing the Project Byzantium weblog archives for the Announcements category.